CardsDirect announces the release of their new holiday greeting catalog for 2008. Images and pricing are shown on a sampling of their over 1,500 holiday cards designs including their new line of recycled paper cards and new digital photo cards. The catalog includes a promotional discount with savings of up to 40% on orders placed before December 1, 2008. Order a catalog online to receive the promo code for the discount. CardsDirect, LLC (http://www.cardsdirect.com) an online leader in custom imprinted and personalized greeting cards is pleased to announce their new Holiday Greeting Catalog for 2008. The 32 page catalog includes images and pricing on a sampling from the over 1,500 card options offered on the CardsDirect.com website. Each catalog includes a promo code that allows savings of up to 40% on orders placed by December 1, 2008. Even greater discounts are offered on orders placed earlier. For those who have not yet received a catalog in the mail, one can be ordered online by going to http://www.cardsdirect.com/catalog.aspx . New offerings this year include a line of Recycled Cards printed on 100% recycled paper. Certain to be quite popular, CardsDirect is one of the few online greeting card retailers offering recycled cards for the upcoming holiday season. All of the recycled cards shown are available on brown Kraft or white recycled paper and come with recycled envelopes. As a show of further support for environmental initiatives, the CardsDirect Holiday Greeting Catalog for 2008 is printed entirely on paper certified by the Forest Stewardship Council. Printed right on the catalog is the FSC Cert no. SW-COC-002550 which confirms that the paper used in the catalog contains fiber from well-managed and responsibly harvested forests. A new line of digital Photo Cards is also featured in the catalog. These photo cards enable you to create your one of a kind card by including your favorite photograph or original artwork printed on the CardsDirect exclusive card design of your choice with a custom imprinted verse and personalization and a gold foil lined envelope. The catalog also includes new designs in categories including Thanksgiving cards, die-cut cards, calendar cards, holiday cards and unique holiday greetings from their distinctive card collection. All cards come with free custom imprinted verse and personalization and matching envelopes. With the newly released holiday greeting catalog, great new card designs, free custom imprinted verse and personalization, first in class customer service and excellent promotional discounts, CardsDirect is the place to order your holiday cards this year. 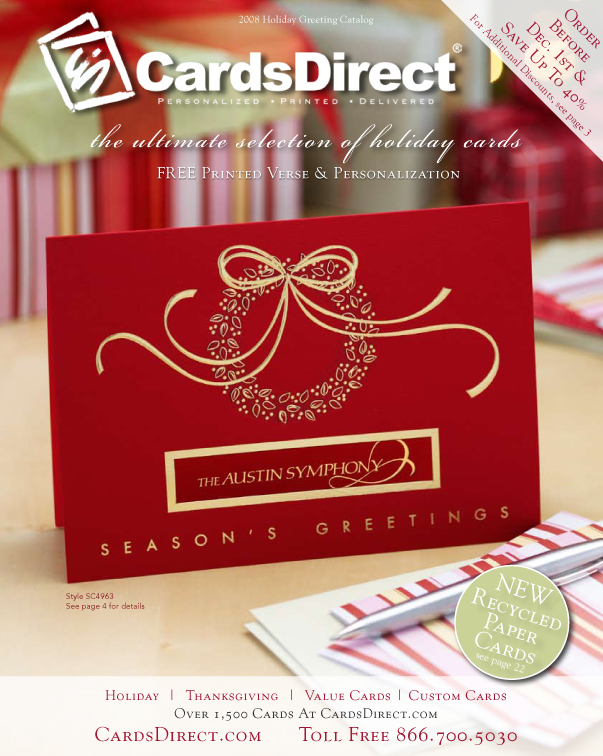 Founded in 1998, CardsDirect, LLC is a catalog and internet-based social expression company headquartered in Plano, Texas that has grown into one of the most trusted online resources for custom imprinted card products. Whether it is 25 cards or 25,000+ cards, CardsDirect gives all orders the personal attention deserved. CardsDirect offers custom printed greeting cards for consumers and businesses including Christmas cards, holiday cards (Thanksgiving, Hanukkah, New Years, etc.) photo cards, thank you cards, anniversary cards and assortment packs for all occasions. All Fortune 100 companies order cards from CardsDirect annually due to an easy ordering process, value pricing, and top notch customer service. CardsDirect has been recognized eight years running as a distinguished dealer and has won numerous awards from industry leaders and manufacturers. The CardsDirect team is always working hard to provide a positive, easy and enjoyable card buying experience.